Breakbeat Paradise Recordings is on a roll right now and are not showing any sign of slowing down as they return with yet another action-packed funky compilation in form of the 4th installment of the beloved Bring Back the Funk series. 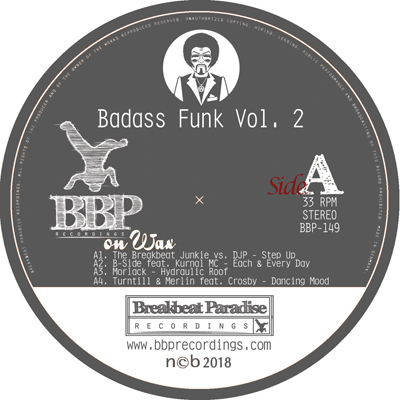 As the previous times BadboE has called upon some of the very best producers in the electronic funk scene to represent a well balanced blend of oldskoool funky gems and bass bangers clinically designed to set dancefloors on fire with Funk! 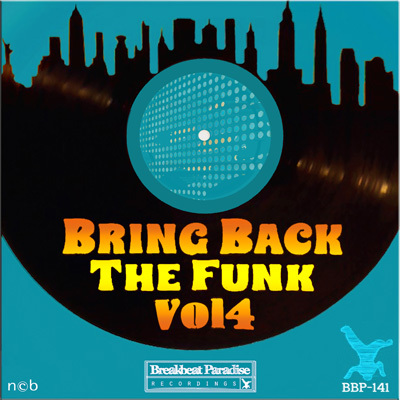 Bring Back The Funk Vol. 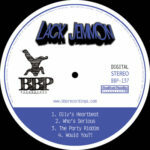 4 features brand new joints from BBP all-star producers, Lack Jemmon, B-Side, BadboE & Proper as well as introducing new artists to the label: Hebegebe and Brian Carson, Kibosh and Synoptix who all have some funky goodness up their sleeves. The EP kicks off with a new joint from BadboE who has teamed up with longtime partner in beats Prosper to Bring That Back once again. They just released a new EP earlier this year on Bombstrikes and here they are again with a groovy party rocking jam. Another duo who has returned for the second time this season is Lack Jammon after dropping their successful 12” vinyl, which has been getting spins in a lot of big festival DJ set this year. Here they are with the catchy Joan Jett tune, which features Kurnel MC on the mic over a rather tasty funky beat. A producer that never disappoints is back to shine once again with a chilled slice of funk – DJ B-Side with a joint called Cali. A perfect way to return after the epic Like This track which has been rocking dancefloors and radio airwaves ever since it dropped on the Badass Funk EP. From way down under we happy to introduce a new act Hebegebe and Brian Carson, with a pleasing funky sound, which sounds like it was made back in the nu funk days. 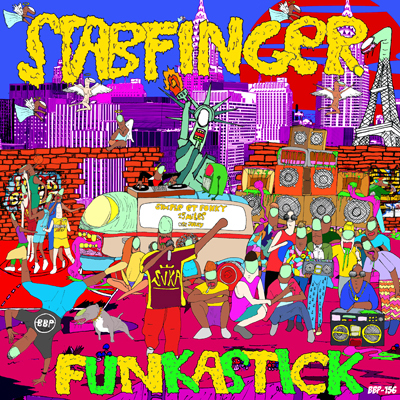 On point and straight up oldskool banger designed to Bring Back The Funk! For the remaining part of the EP we’ll welcome some bass to the party – first up brought by the talented Kibosh who returns to BBP for the second time after featuring on the Swing That Funk compilation. Last but not least we’ve called on Funk Fury new act called Synoptix to finish the party with a blast of a funky banger. BBP is dedicated to bringing you the very finest in the funkier spectrum of the electronic breakbeat scene. 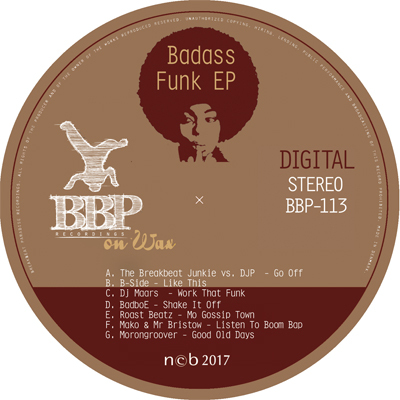 VA – Badass Funk EP – Out on Digital! Available in all other stores Oct 12th 2017. Breakbeat Paradise Recordings is back to mark the 10th year of being in the ghetto rockin; funky breaks business. To celebrate that we’ve decided to hit you hard with a 7-track vinyl release to represent the very best of what the label has to offer. 7 of the very best producers in the funky breaks scene have joined forces on this ruthless funky bomb of an EP! After selling out all vinyl and getting support from major djs including features on the Craig Charles Funk and Soul show this release is available on digital format. 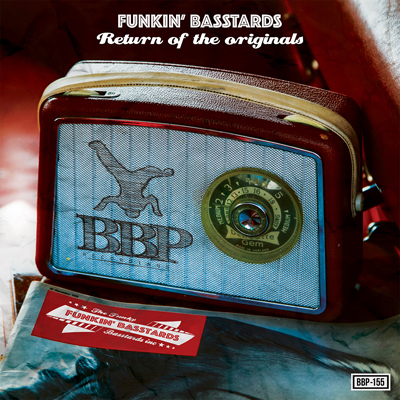 With the Badass Funk EP the BBP All-Star team is taking it back to the timeless sound of the oldskool that the label has kept on rockin’ since they first started in 2006. Since then the label has navigated through related genres like Nu Funk and Ghetto Funk without loosing track of the base core. Every since the first release: Sound of Invasion by BadboE the label has kept a strong grip on the funk, the breaks and the street vibes of the oldskool. To kick things off we brought back 2 of the very best producers in the game The Breakbeat Junkie & DJP, who’s been responsible of some of the classic BBP tunes like Freak Hop Part 3 and Represent The Style. Here they are back in better shape than ever to do their thing on the Go Off jam. To follow things up we call for a true ghetto funk phenomenon: DJ B-Side, who just started to drop party bombs for us last year. But B-Side has been a household name in the ghetto funk scene for years and has released several legendary EPs for the Ghetto Funk label. Just when you thought it couldn’t get any funkier we brought in DJ Maars from down under to tease us with the skanky funk jam: Work That Funk. It wouldn’t be much of a BBP anniversary release without a tune from label owner and funk breaks veteran: BadboE. All striped down to the core BadboE’s cooked up a funked up jam that oozes oldskool funk from start to finish. Moving on with more skillful mashup business from one of the scene’s favorite DJ and producer: Roast Beatz. 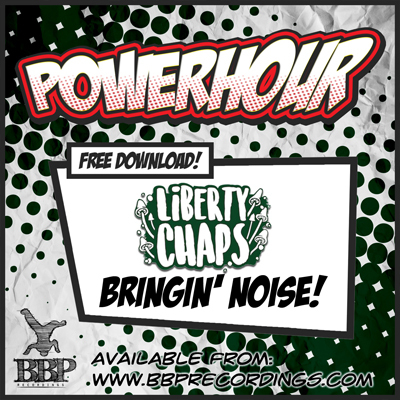 This is the first release from Roast Beatz on BBP since his epic album release: Luxury Boom Bap that dropped last year. The Boom Bap continues on the track from BBP residents Mako & Mr Bristow, who team up for some more of their addictive throwback funk business. Last but certainly not least a true expect of the oldskool: Morongroover is ending things big with his Good ‘ol Days joint. BadboE feat. MC Shureshock – Under The Spell EP – OUT NOW! 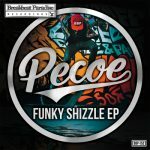 Breakbeat Paradise Recordings has brought in the big guns for another huge spring release by label owner and funky breaks veteran BadboE. When BadboE returns for an EP drop you can expect loads of party flavors, big beats and of cause his signature happy vibes. To maximize the party atmosphere, he turned to old friend and partner in crime from down under – Mc Shureshock who once again spits fire with style and putting us all Under The Spell of this addictive party rockin’ jam. As so many times before BadboE has done back deep into the treasure chest of funk and soul and brought out a big groove, which he has flipped around and brought into the new millennium, by adding his consistency party breaks flavor and electronic funk basslines. On remix duties we find some of the very best the scene has to offer: The ghetto blastin Phibes brothers are bringing heat on their bassy hardrockin remix that throws some big synthlines into the mix. Nu Disco sensation Dr Packer is rocking the funky breaks on his undeniably groovy remix while discObeta slows it down for some chill-out vibes on their doOva remix. 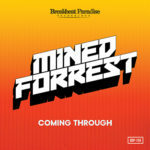 Finally, funky breaks producer Trotter pays back on BadboE recent remix by doing a rerub for this EP. The package comes with instrumental mix of the original for the DJs who want to put their own take on groovy track. From your dedicated and always relievable source for the unspoiled funky beats and breaks: Breakbeat Paradise Recordings. Zenit Incompatible Yes 9 Quality!!! Funk Ferret Yes 9 Some great classic wobble bass sound here! Timothy Wisdom Yes 7 Not surprising the Phibes remix stands out. I’m diggin the discobeta doova vibe too. Chudy (Tru-Funk) Yes 7 Dr Packer remix is my favourite, i’m gonna play this one in my sets for sure ! B-Side Yes 8 Great stuff! DJ Cockney Nutjob Yes 9 Funky fresh uplifting vibes with bouncy vocals from sureshock…. and an amazing mix of versions to select from! B-Roll (FreebreaksBlog) Yes 7 Love the vibes from Phibes! Trotter Yes 10 Sweet, cheers !!!! Stickybuds Yes 7 Phibes remix is pretty cool. Thanks! Dj One (Aliens In Denmark) Yes 9 So many different vibes!!! Breaks Ida Yes 6 Nice one. Dj Clairvo (MustBeat) Yes 10 Wow, this is a pretty strong release! Can’t really pick my fav. one!! Each remix has got something to say… well done!! Jayl Funk Yes 9 Dr Packer and Trotter Remix are awesome! 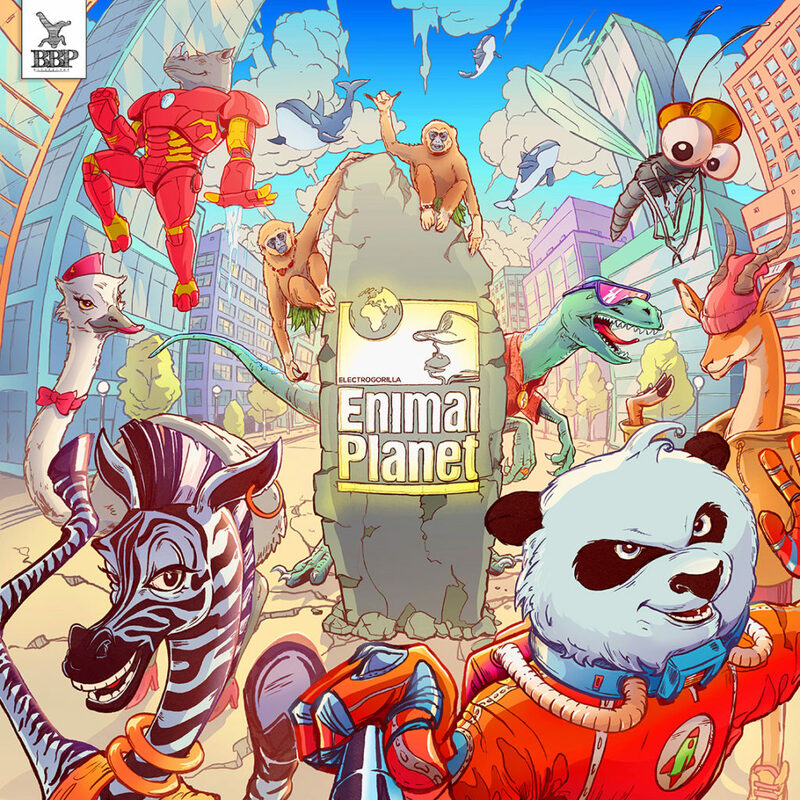 Breakbeat Paradise Recordings is back with a huge release to kick off the new year. 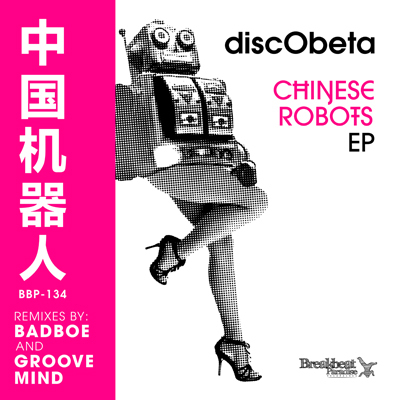 US-based discObeta is dropping their first EP on BBP with 2 epic originals with remixes by heavyweight producers BadboE & Groove Mind. The title tune Chinese Robots was first released last year on the compilation Big Fat Mama Beats, and because of the huge success the song has got from all over the world we decided to dedicate a full EP to the song. What started out as just small sample from a Chinese news clip turned into an infectious dancefloor anthem. On this EP the original jam is accompanied by a big glitchy remix by Italian super producer Groove Mind. 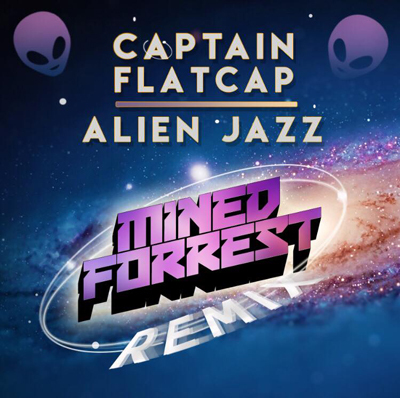 This remix takes all the catchy vibes of the original and mixes it in a bit of electro funk/wobble basslines and big synth sounds. The second part of the EP is taking it back to the oldskool with the street banger called No Doubt. The original Funk 2da Brain mix gives something for the break headz to get down to with some funky breaks and big basslines. All and all a package that should be sure to turn just about any dancefloor on fire. 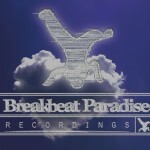 Look out for more dancefloor dynamite from the discObeta producer team soon here on Breakbeat Paradise Recordings! Read full 5-star review here! Video: 40.000 views on youtube! To celebrate the digital release of the Ghetto Funk Testament, BadboE is giving away the directors cut of the classic Playin Yourself jam that was released on Booty Fruit in 2013. 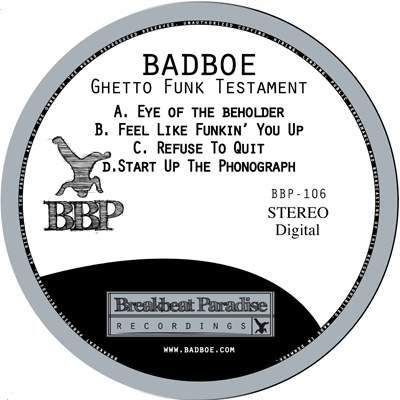 BadboE – Ghetto Funk Testament – Out now on Digital! 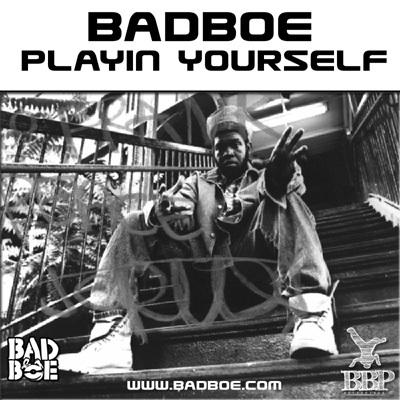 This is the first major release from BadboE since his successful second album Pump Up The Funk that dropped in 2012. Followed by an instrumental EP and a remix album, which very much celebrated the ghetto funk sound with tunes from the very best in the scene. Making a full Ghetto Funk EP was a natural next step for one of the pioneer players in the funky breaks scene, who has been one of the go-to sources for all funky DJs for the last 10 years. BadboE’s approach on ghetto funk however is not taking itself too serious, but focuses on the good samples and heavy beats and just enough bass to keep it ghetto without loosing the soul of the music. All 4 cuts on the EP keeps up that happy funky vibes and the b-boy flavors that BadboE is known and loved for. Breakbeat Paradise Recordings is now one of the last labels to be releasing funky breaks/ghetto funk on vinyl and we are proud to continue to provide the very best this scene has to offer. This EP will remain exclusive for vinyl DJs for the next 6 month before dropping on digital. “It seems like it’s been ages since a solo original Badboe release – let me see now, that would have been his Pump Up The Funk LP in…2012. But that was three years ago! Good lord! It really hasbeen ages since a solo original Badboe release. Fear not though, this scene legend is back with a vengeance putting the fun back into ghetto funk in a testament that is tantamount to a dancefloorclarion call with…Ghetto Funk Testament. Feel Boe flow on Eye Of The Beholder as he breaks the body of a beat with a vocal snippet from Treach forged into a hook which is juxtaposed with another hook forged from some late seventies/ early eighties soul flavour. Feel Like Funkin You Up, will also make you feel like dancing (not to mention feel the beat y’all) something you’ll be likely to Refuse To Quit when you hear the orchestral ghetto soul of track three and insistent synths-plus-cheeky ‘guest’ vocals from Brooklyn’s one hit rap wonder Uptown on the closer. Dope on plastic! Actually, as the PR is wont to point out, BBP is one of the last labels still dropping this kind of stuff on wax. Not only that but this release will be a vinyl exclusive for six months – so if you want these beats you know you need to get physical. 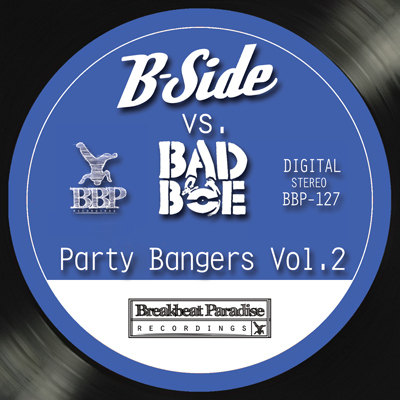 B-Side vs. BadboE – Party Bangers Vol. 2 – Out Now! Breakbeat Paradise Recordings is very pound to welcome back one of the Ghetto Funk scenes finest producers: B-Side for the second installment of his Party Bangers series. This time he’s teamed up with another heavyweighter – BBP’s very own BadboE to line up 4 big tunes designed for maximum dancefloor destruction! Party Bangers Vol. 2 takes us on a musical journey through different areas of electronic funk: from the peak time ghetto funk bangers – over Reggae grooves, electro swing to end up with a disco anthem. 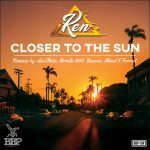 The musicality plays a big role on these tunes and its easy to recognize both producers signature through-out this EP. The EP kicks off with a big electric funk bangers Funk Me Again, which takes elements from a classic funk jam and mixes it with some J5 party rap in a progressive ghetto funk arrangement. Rewind it Back takes on some catchy reggae summer grooves and slams on some big beats and wobble basslines. Do You Wanna Ride flips it around with some electro swing vibes to makes sure the party keeps on riding. Last but not least its time for B-Side & BadboE to Get Busy on an extended disco anthem. 7 mins of groovy disco goodness. For those of you who trying to steer clear of the mash-ups or wants to do you own mixes, all 4 tunes comes in instrumental versions. DJ Cockney Nutjob 10 Awesome EP filled with a variety of flavours that will destroy your dancefloor! Doe Ran – Bootlegs & B Sides 9 That’s some fine work fellas. Psychotropic Frequencies 10 Great EP, B-Side and Badboe nuff said! Doctor Hooka 10 What a team, pure funkin’ fire!! B-Roll (FreebreaksBlog) 10 Fire as usual! Mr Bristow 10 Great stuff – funky as f**k! Trotter 8 Sweet !!! Cheers guys !!! Dj Dub:ra 9 Dope stuff, love it! ….So cool that you included Instrumentals! Prosper 7 Nice package ! Buba King 10 Two of the finest Funky Heavy Hitters in one Super Combo!!! Funkliners 10 Great ep! Can’t wait for us to play these out. floor filling shizzle! JD Michaels (Broken Racket – NBS Radio) 10 Dope release, all these tunes are solid. Thanks for the instrumentals, I’ll make good use of them!